This web site is for your personal and noncommercial use only. You may not modify, copy, distribute, transmit, display, perform, reproduce, publish, license, transfer, or sell any information, software, products or services obtained from this web site. 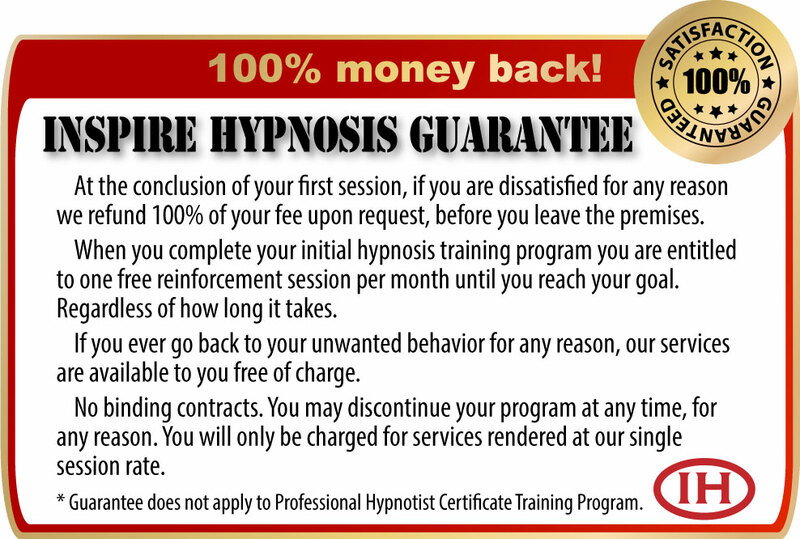 Any use of the term “We”, “Us”, or “Our” herein refers to InspireHypnosis.com. InspireHypnosis.com collects information from our users at several different points on this Web site (this “Site”). For example, we may collect personally identifiable information from you such as your name, address, and e-mail address when you contact us. In addition, we automatically collect non-personal information such as your browser type, operating system, IP address, and site usage information, in order to evaluate and improve the performance of this Site. We may also use third party providers to help us contact you or to support this Site and services, and for these limited purposes, we may share your personally identifiable information with our providers. By registering for and/or using this Site, you consent to our sharing of your personal information with our third party providers for these limited purposes. Personal information collected by InspireHypnosis.com is stored in reasonably secure operating environments that are not available to the public. We are dedicated to maintaining the security of such information. However, no data transmission over the Internet can be guaranteed 100% secure. We cannot ensure or warrant the security of any information you transmit to us, and you do so at your own risk. Once we receive your transmission, we make our best efforts to ensure its security on our systems. We may place a text file called a "cookie" in the browser files of your computer or use other technology to improve your navigation of our site. The cookie itself does not contain your personal information, although it will enable us to relate your use of the site to information that you have specifically and knowingly provided to us.